Hello, New York! I love this city. Waking up to the sounds of a bustling street makes me all warm and fuzzy. For this session, you can look at the Twitter hashtag #11b. Today we’re talking SEO metrics. Rhea Drysdale (@Rhea) from Outspoken Media is up first. She is talking about rankings being the metric that’s been tracked traditionally for SEO. One portion of SEO is seriously in trouble, and that’s rankings. Next up is Vanessa Fox (@VanessaFox) from Nine by Blue. Vanessa is talking about her days at Google and how she helped launch Webmaster Tools. She talked to a lot of engineers while she was there about rankings. Her challenge to day is taking that information plus the experiences with her own clients over the past five years. She wants to take about metrics that matter. We often don’t step back to ask “why” – why are you tracking the metrics you do? Look at everything in context. When rankings drop, we jump to a lot of conclusions and have a long list of things that may have happened. First thing you want to do is look closely at your data. Perhaps it’s a seasonal thing. Perhaps it’s not a penalty, like many people jump to. Use real click-through rate. We often think about higher ranking = better. Do some small calculations to forecast what the change in traffic might be if you increase your ranking by one. Sometimes there’s not much difference. Look at the technical details. As marketers, we often shy away from the technical and try to leave that to the technical people. You have to find a way to bridge the gap. Next is Ryan Jones (@RyanJones) of SapientNitro. How do you measure your SEO recommendations? This is one of hos favorite interview questions. He doesn’t get a lot of good answers. If your main metrics are PageRank, Alexa Rank or anything similar, these are not the metrics you want. Then, pick metrics that can help you measure that. Use sales data not search data on something. For example, looking for search volume on Macbook pro vs. Macbook air and targeting a newsletter towards Mac users. If you look at which one has the highest search volume to determine the subject matter, this isn’t fruitful. Ask which one has more sales. The context makes things worthwhile. The difference between reporting and analysis is a huge difference. 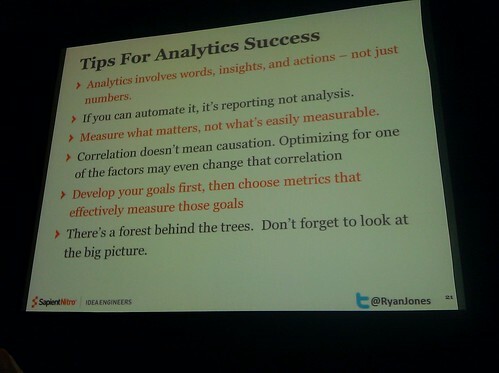 Reporting tells you what a number is, analytics tell you what to do with it. 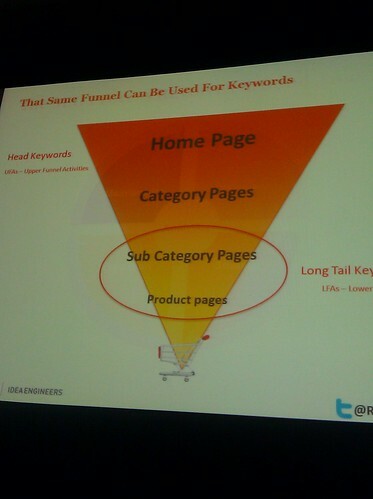 Map keywords to your sales funnel to see how they are trending. Ideally, visits and lower-funnel trends should mirror each other. Bucket keywords into user intents as well to get a big picture. Finally, Rob Bucci of STAT Search Analytics (@STATrob) is up. Despite the subject matter in this session, he says rankings are still very valid. Personalization, local and social has baselines – rankings can help you get a baseline. They might jump, but it gives a good picture. People say obsessing over individual keywords is myopic. Focusing on individual keywords can be myopic, he admits. The modern SERP is very data rich. So we need good tools. And we need to look at SERP analytics. You can look at all the elements on a SERP, and choose which element you want to measure. Bucket your keywords, for example: research, ready to purchase and unhappy customers. Measure your keywords in aggregate for each bucket. What percentage of Page 1 is yours for those keywords? Who is competing with you on research versus sales terms? How many Page 1 rankings do you have in Colorado versus New York? Rank trackings is dead. SERP analytics is what works.